As signal a 100 kHz square wave (between 0 and 5 volts) generated by an Arduino. I want to control the transistor so it will let the current from the supply pass through when the square wave is ON (5 volts) and in to the circuit (represented by a resistor/impedance in the image below). The supply will be at 5 volts. And the transistor NPN used is a NTE85 with DC gain between 100 och 300 among other characteristics. I think a base resistor might want to be added to control the current/voltage at the base and therefore set the transistor in cut-off mode and saturation mode to act as a swtich. But I'm not quite sure how to go about all this. What do I have to think about to make the above work? What do I need to add/change/calculate? What characteristics of the transistor do I need to consider etc.? I little guide for this particular case would be much appreciated. You circuit has many limitations and may well not be suitable at all, but to begin to see the limitations you need to draw the circuit in a more understandable format. Vout from Q1 will always be less than the supply voltage. 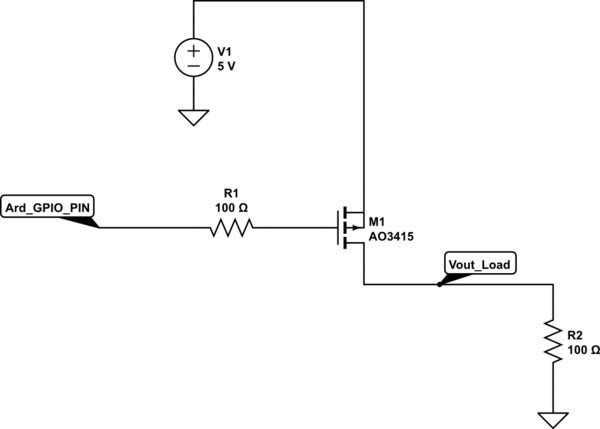 If your load requires 5V, then this circuit cannot achieve it with a 5V supply and Emitter follower. If V1 is the same as the Arduino supply, then Q1 can never quite saturate. If the load includes any capacitance, when you turn off Q1 the Base-Emitter junction is reverse biased. Even in this case (a 5V supply) the NTE85 is at its minimum reverse bias limit. You would normally NOT design to the limit and would seek to clamp the reverse bias to LESS then 5V. You could use a PNP BJT (as suggested in another answer) but this may not improve your situation greatly. The saturation voltage of most BJT devices is in the 0.2 - 0.6V range so you still lose a significant voltage across the device. In the other answer for example, the suggested 2N3906, the saturation voltage at 50mA is about 0.4V. This means that your load voltage is likely at best about 4.6V and at worst about 4.4V. The logic is inverted if you use a single PNP device, although it should be easy to invert your driving logic in the Arduino code. NOTE: Using a single P-channel FET inverts the logic, so High = OFF, Low = ON but I'm assuming this would be easy for you to handle in software. The two most important parameters for the P-FET for this application are a low VGS(th) and a low RDS(ON). Here I've shown an AO3415 to fit this bill but it is in a SOT-23 package. Unfortunately getting extremely low RDS(ON) in a TO-92 package is a real challenge. If you assess something like a 2N7000 or 2N7002 you can see that RDS(ON) could be as high as 12 - 13 Ohms. This means that even at a moderate 100mA load you could see an on voltage of over 1V which would be unacceptable in most cases. The AO3415 with an RDS(ON) of about 50 mOhms would drop only a few mV. 1)You need to use a PNP transistor for this case and not non cause as you mentioned you want the current to enter the circuit when the supply is at 5v. 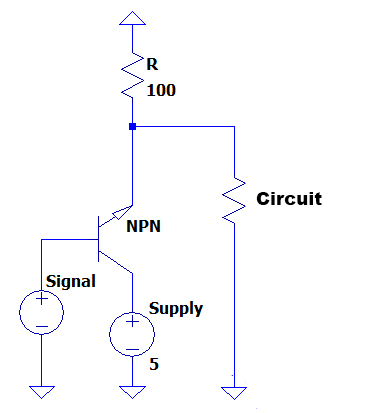 The npn won't work in the circuit given if the circuit resistance more than the 100 ohm resistance. 2) The need of resistance on the base of the transistor or rather at any terminal depends on how you want to make it function and the voltage drops across the base- emitter (Vbe) and other 2 combinations. The voltage drop across Vbe or any other combination and the ratio between them should be maintained. It should not exceed the given value in the datasheet as it could damage the transistor. Consider these 2 points and you will be able to find the resistor values using simple ohms law. Hope this helped. Not the answer you're looking for? Browse other questions tagged power-supply transistors signal npn or ask your own question. Is the saturation current different for different base current in CE configuration of a transistor? Does a transistor reduce current flow?